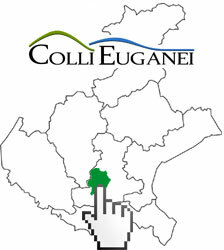 Welcome to the Euganean Hills! The Euganean Hills unexpectedly stand out in the heart of the Venetian plain along with their distinctive conical volumes. Their quite perfect geometry is the stunning outcome of volcanic phenomena dating back to over 40milion years ago. Besides the scenic charm of the landscape, prominent is also the unique natural environment as well as an amazing wealth of cultural heritage. Several enchanting corners of unspoilt nature and suggestive historical hamlets span. along several paths you can walk within the Park. Sundry local culinary delights will make your stay on the Euganean Hills more exciting and satisfying: namely, the valuable wine you can taste as well as, the exclusive cuisine specialties you will enjoy in numerous restaurants, taverns, farm holidays and wineries. 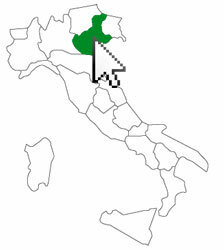 Where are the Euganean Hills? Come and know the 15 Euganean municipalities where, thanks to the beauty of their castles and their renowned villas, you will revive the history that made them notorious. Dipped in a haven of peace, vineyards overlook the whole area, giving rise to excellent wines, famous all over the world as well as the local culinary products. Freely move in the open: on foot or by bike, you can explore sundry paths on the Euganean Hills, in the midst of nature. Relax and peace are fundamental of course; by the way, a tasteful cuisine is also a basic ingredient of the right mix for a perfect holiday. Let you win by the hospitality of our thermal hotels and by the romantic farmhouses immersed into the green, a symbol of the most ancient Venetian tradition. The Euganean Hills are a mountainous territory made of around 100 elevations, whose height never exceeds 600metres. Their peculiar geological history led to the birth of an extraordinary botanical and fauna biodiversity, which has been safeguarded since 1989, by establishing the First Regional Venetian Park. Further to its environment defense function, this Park is also in charge of tourist enhancement of natural resources. A dense network of hiking paths and trails allow. to explore the area in a sustainable way: as a matter of fact, on foot, by bike or on a horseback, you can discover the most beautiful views of the Euganean Hills skipping into the nature and practicing your own favourite sports. The territory of the Euganean Hills, bearing a 3000 years old history (which is told through several archaeological sites, museums and monuments) represents the ideal destination for lovers of art and culture. Este embodies the cradle of the Paleovenetian civilization, Arquà Petrarca hosts an enchanting medieval hamlet, Monselice stands as a scenic medieval walled city: they are among the most important historical centers. Moreover, do not miss the beautiful Venetian villas, such as Villa Vescovi in Torreglia and Villa Barbarigo in Galzignano, as well as the picturesque monasteries of Praglia and Rua, where time seems to stop to provide visitors with moments of deep spiritual peace. The main tourist attraction in the area is the basin of the Euganean Spas, renowned destination for stays of wellness and relaxation. There are numerous hotels in the Euganean Hills: just think of the hotels in Abano Terme, which, together with those of Montegrotto, Battaglia Terme and Galzignano represent the largest spa center in Europe. The salt-bromine-iodine waters, which flow in a large area to the north-eastern margin of the Euganean Hills, bear thermo-mineral properties which are unique in the world and are used for both therapeutic and aesthetic treatments. The origin of thermal springs is directly related to the particular geology of the area. Rainwater coming from the Alpine foothills flows in the dolomitic limestone underground to more than 3000 meters depth, reaching very high temperatures (over 87 °C) and getting rich with minerals. After about 80 km, they meet, at the Euganean area, some impermeable layers of igneous rocks, which enable their ascent to the surface as a result of geothermal energy. The benefits of the Euganean thermal waters were already known to the ancient Venetians and widely exploited in Roman times. In the eighteenth century, the building of factories for the balneotherapy led to the emergence of a growing tourism phenomenon. Today, the basin of the Euganean Spas boasts more than 100 hotels all with indoor thermal swimming pool and equipped in order to offer the highest quality specialized treatments.